You can be excused for having trouble deciding between vinyl flooring and laminate flooring. Manufacturers promote both products as durable, budget-friendly, DIY-friendly products, and even appearances can be similar, especially if laminates are compared to newer luxury vinyl flooring (LVF) planks. Like some styles of laminate flooring, luxury vinyl flooring can look remarkably like natural wood and natural stone. But while the materials have many of the same virtues and may even look much the same, these are much different flooring materials, which becomes apparent when you look at each of them based on a variety of criteria. Overall thickness for vinyl ranges from 1.5 mm for sheet vinyl to 5 mm for luxury vinyl planks, making these products decidedly thinner than most laminate flooring. Laminate flooring is similar to luxury vinyl planks in its look and installation, but the critical difference is that the surface is a hard plastic laminate with printed design layer, while the core layer is rigid fiberboard, a product made from wood byproducts bonded together with melamine resins. Overall thickness for laminate planks ranges from 6 mm to 12 mm. Not long ago, it was quite easy to distinguish vinyl from laminate flooring. Vinyl floors were usually sheet goods with printed patterns, often designed to look roughly like ceramic tile, though not very convincingly. And laminate plank floors were "wood look-alikes" that was also less than convincing since they looked and felt like the plastic materials they were. But modern laminate flooring and luxury vinyl can now both look remarkably like wood, stone, ceramics, or just about any material. They may even have three-dimensional texture to the surfaces, such as forms that resemble hand-scraped hardwood. Both vinyl and laminates are still less expensive floors than natural hardwood, or ceramic or porcelain tile, but the appearance is considerably less "cheap" than it was a few years ago. Sheet vinyl may still be a bit of a bargain option, but when comparing luxury vinyl to laminate flooring, there is no longer a clear winner. The obvious winner here is vinyl flooring. All forms of vinyl flooring—sheet vinyl, vinyl tile, and luxury vinyl—are made with materials that are 100 percent waterproof. In family bathrooms and damp locations such as basements, vinyl flooring materials are the clear winner. Sheet vinyl that comes in 12-foot wide rolls often requires no seams whatsoever, making it the best of all choices for a totally waterproof floor. Manufacturers of laminate flooring are working hard to create materials that truly waterproof, but except for a few experimental products, virtually all laminate flooring uses a fiberboard core, which, because it is a wood product, will soften and swell if it is exposed to water. The best that manufacturers have managed are products best described as "moisture-resistant." For family bathrooms or other areas where standing water is likely, laminate flooring is a poor choice. Some manufacturers even stipulate that their laminates should not be installed in basements. For wet locations, true water-shedding flooring, such as vinyl or ceramic tile, is the best option. The choice is less clear in areas that might experience moisture, such as kitchens, powder rooms, guest baths, laundry rooms, mudrooms, and entryways. If you can reasonably dedicate yourself to cleaning up occasional spills and puddling immediately, then go ahead and install a laminate flooring marketed as "moisture-resistant." The danger with laminate flooring is when standing water is left on the floor long enough for it to seep through the seams and down into the fiberboard core. Sheet vinyl can be a difficult material for do-it-yourselfers to install, but luxury vinyl planks are fairly easy, which is one reason for luxury vinyl's growing popularity. Laminate flooring planks, with a comparable click-and-lock installation method, are similarly easy. In fact, this easy installation system was largely what caused the explosion of interest in laminate floors, since it offered DIYers a means of easily achieving a floor that looked like hardwood. There is a slight edge toward laminate plank flooring here, as the click-and-lock system is more secure than the current interlocking system for luxury vinyl planks. An ordinary circular saw or table saw equipped with a fine-tooth blade, or even a hand saw, easily cuts laminate planks. If you are installing sheet vinyl, though, professional installation is your best bet, since it is quick and not very expensive. Laminate and luxury vinyl flooring is roughly comparable in price, although sheet vinyl does hold an edge. Vinyl flooring purchased at big-box home improvement centers can range from about $.40 per square foot for thin sheet vinyl, to $3.00 or so per square foot for luxury vinyl planks. Laminate flooring ranges from about $1.00 per square foot for 7 mm-thick planks, to about $3.00 per square foot for 12 mm-thick planks. Both luxury vinyl and laminates are available in much more expensive designer products at specialty flooring stores. There is a slight edge to laminate flooring here, as it is usually regarded as superior to vinyl when it comes to improving the resale value of a home. But vinyl flooring's stature has been creeping upward in recent years, especially with the introduction of luxury vinyl flooring (LVF). But while buyers may expect—or excuse—vinyl flooring in the bathroom, they will cast a more critical eye on a living room floored with vinyl, even good-quality luxury vinyl plank flooring. Laminate floors do not lend the prestige of solid hardwood, engineered hardwood, or ceramic tile floors, but they usually do not put off prospective home buyers. Laminate flooring is slightly more advanced than luxury vinyl when it comes to features such as deeper embossing, better imaging, and improved joinery systems. Laminate flooring products can feel somewhat hollow underfoot when compared to the wood floors they are supposed to mimic. They also tend to transmit noise, though introducing a foam underlayment beneath the flooring, as recommended by some manufacturers, can reduce both the hollow feeling and the noise factor. Some people feel that because laminate floors are thicker than vinyl and incorporate wood content, they are warmer to the touch and easier to walk on. Vinyl floors of all types are fairly cold and can be hard on the feet, especially when installed over concrete or existing ceramic tile floors. One advantage to vinyl is that it is called "resilient" for a reason—dishes dropped on vinyl kitchen floors often do not break, while they almost always shatter when dropped on bare laminate floors. The resilient surface also slightly quieter, since sound does not echo in the same way it does off the rigid surface of a laminate floor. If using "green" building materials is important to you, then laminate flooring probably has a small advantage, thanks to the natural wood content of the fiberboard core. Some manufacturers offer laminates that qualify for LEED MR4 (Recycled Content) status. But laminate flooring still uses a plastic surface layer, and the melamine resins used in the creation of the core level are by no means green materials—they may off-gas chemicals. Vinyl flooring is no longer the bad boy it once was. Some manufacturers now produce vinyl flooring that achieves a LEED credit EQ4.3 for Low-Emitting Material. Still, vinyl is a synthetic material that is known to produce toxic chemicals when burned. Vinyl does not decompose in landfills, and recycling it is usually not an option. 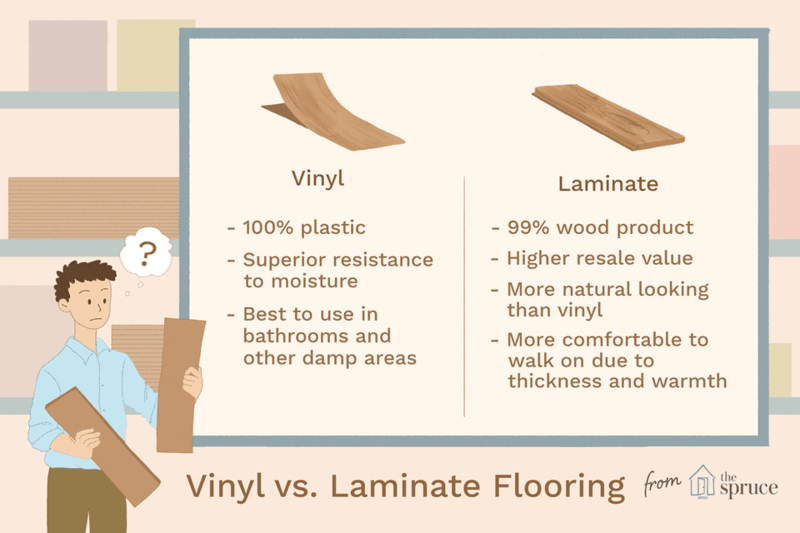 In short, neither of these materials is environmentally friendly in the way that natural wood, linoleum, or bamboo is, but laminate owns a slight advantage over vinyl, thanks to its 90 percent-plus wood content.